Welcome to Stage II of the CDO image migration (backup)! We need your help to continue backing up image content here on CDO, from Photobucket (if you find Image Shack content feel free to back it up, but make sure you save images with the correct filenames, and make it clear when you send in the zipped content that it is Image Shack content, not Photobucket). Because backing up another member's content is a much more laborious task than backing up your own Photobucket content, CDO would like to offer a medal to members who are willing to help out. The medal is an upgraded version of the flaming fractured camera from the Stage I Photobucket migration thread. 1. Check the member list at the bottom of this thread (which is continually expanding), OR search for members via the Member List search function (or via Google if they've gone Unregistered), OR look for old favourites from your own memory, OR trawl through showcase, army blogs, conversions and tutorials to find members (this latter stage is particularly relevant for Unregistered members). Check this Stage II thread to see that no one else has announced that they'll backup that member's content. To avoid duplicating work, please leave active member's content for them to backup themselves, for the time being. Please do not pick more than one member at a time. Announce in this thread the name of the member whose content you will backup. Staff will check periodically and update the master list at the bottom of this post. 2. Enter the member's profile (unless the user has become Unregistered), open any army log/showcase links in their signature may contain, but most importantly use the Find All Threads function. 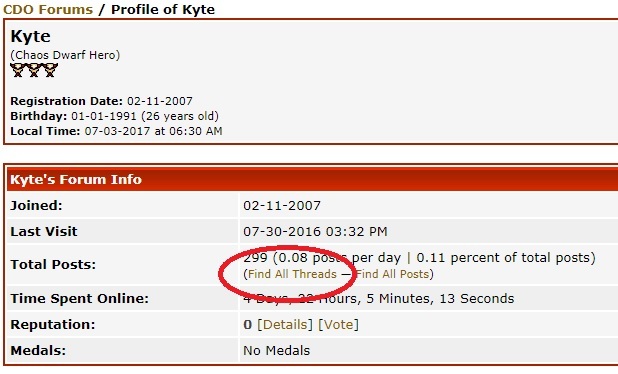 When searching for threads, look for Showcase, Army Blogs, Conversions & Tutorials. These are the threads that may contain Chaos Dwarf images. The Off-topic Showcase has lower priority, so back that content up last. 4. Once you reach the threads start looking for Photobucket links. In the DAGabriel example above, although the images are loading correctly (for now), if you right-click on the images you will see that they link to Photobucket and will likely be blocked very soon, if not already. 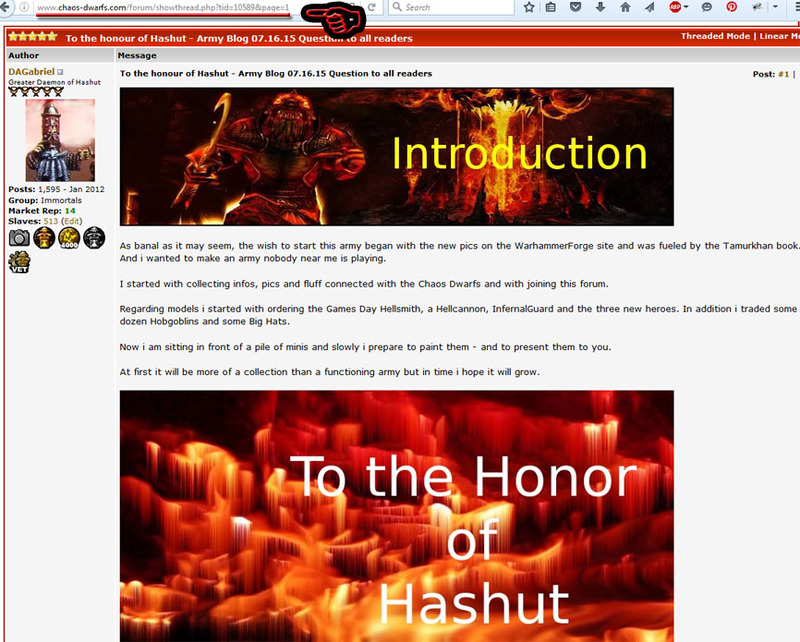 You will need to make note of the member's Photobucket username, in this case triekehr, and you will also need to make note of the subdomain, i964. We need both of those pieces of information to get this fix to work. 5. Unfortunately, saving the images directly will not work as the browser saves a redirect html page from Photobucket as the .jpg you're trying to save. 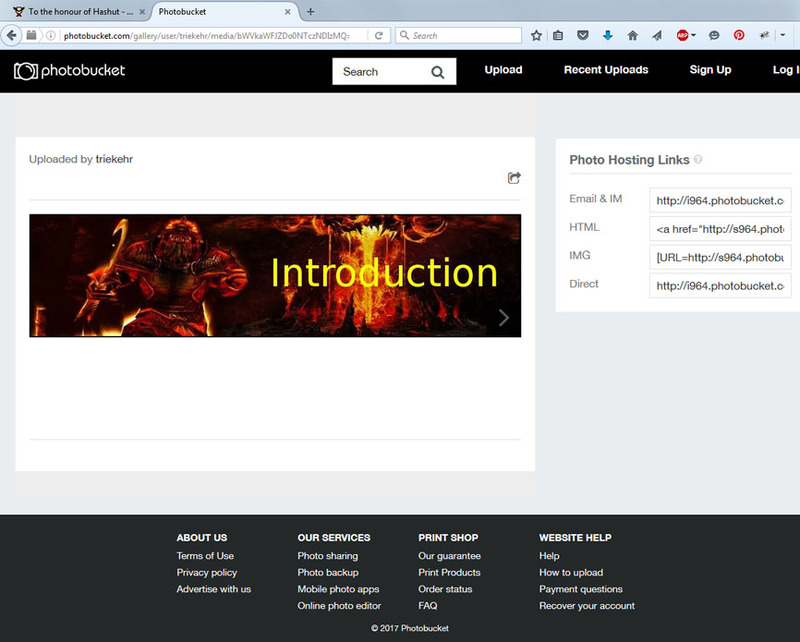 From the Photobucket interface you can right-click and save the image to your system. 6. Continue saving images for the CDO member in the same manner as above, going post-by-post through the threads you are assigned. Be sure to double-check the location of images that appear to be loading correctly, because like the images in this example, they are hosted by Photobucket and they aren't going to work for much longer. Be sure to backup any linked images the member may have in their signature as well. 7. Once you finish backing up all of the images in a thread you will need to zip all of the images into a new archive. 8. Upload the .zip file to Dropbox, Google Drive, or any other storage service and notify the Staff member that assigned you the task, or send a PM to the generic Staff account with the link to download the .zip archive. They will take over the files from here. 9. Report! Announce in this Stage II thread that you have backed-up the member's thread (please list their username and the thread), and mention if it is missing anything. 10. Finally, you can either pick another member (back to step 1), or take a break and await your new medal. Please note, awarding medals may take a little time as we will likely award them in batches. Thanks in advance to everyone that can help us out. There is a lot of work to do, but with any luck we'll recover most of our missing and endangered content ASAP! This post was last modified: 07-26-2017 07:26 AM by Admiral. A (P) after an account name signifies a link to that member's profile or a link to that member's "Find All Threads" search results. Use it for quick link! Abecedar (P) Active member, sorts his own images. bas_2312 (P) Active member, sorts his own images. clam (P) [Army Blog (DONE): Link] Active member, thus sorts his own images. cornixt (P) Active member, sorts his own images. Dînadan (P) Active member, sorts his own images. Continues below. Link list is too vast for a single post to handle, resulting in fraying ends. This post was last modified: 08-06-2017 08:08 AM by Admiral. Staff hijacking of this post since the lengthy name and link lists have reached the limits of what BBcode can handle, resulting in fraying ends of the lists. Solution: Spread-out over several posts. Nicodemus (P) [Army Blog (DONE)] [Off-Topic Showcase] [Project Development 1] [Project Development 2] Active member, sorts own images. Pappa Midnight (P) Active member, sorts own images. TheHoodedMan (P) Active member, sorts own images. Zanko (P) Active member, sorts his own images. This post was last modified: 08-07-2017 12:30 PM by Admiral. This post was last modified: 08-06-2017 08:06 AM by Admiral. Started at the top of the list! Abyss is done! This post was last modified: 07-04-2017 07:50 AM by Grimbold Blackhammer. Working on Khan now. Luckily all his images are in his bucket so i just need to download the whole album and rename the zip. Ive got all my own photos downloaded as well and already changed the first 9 pages of my blog to imgur links. This post was last modified: 07-04-2017 11:36 AM by Pyro Stick. Correction, looks like I'll have some time today to do this. If the members Photobucket username has a underscore in it (in this example m3lvins username is Crow_89) will that mess things up? Not at all, just make sure you include it as well! M3lvin's thread "[01-03-2010] -m3lvins CHAOS DWARFS (pic heavy)" Completed! This post was last modified: 07-04-2017 11:41 AM by Carcearion. Hmmm... what about The Great Emissary Exchange? since that blog has images from multiple members how would one go about doing that one? This post was last modified: 07-04-2017 01:59 PM by Carcearion. Unless we luck-out and have most of the contributing members backing up their content then it will require staff involvement as posts will have to be manually redirected in some cases. You've got the right idea though - it's a bit of a dog's breakfast. What I've tried to do to start is stick with the quickest and easiest fixes for now, but they won't solve all of our problems. I just wanted to personally thank everyone who is helping out! Great job! On Firefox (and Chrome), you have developement tools integrated to the browser. You can activate them by pressing "Ctrl + Maj + I" on Firefox. Then you have a few menus, the last one should be "Network" ; Click on it. Reload your CDO blog page. Every call to the servers are logged here. Once loaded, you can sort by domain and find the calls to photobucket. And you'll find every image url for this page. Activate them by pressing "Ctrl + Maj + I" on Firefox. Nice!! Thanks for the tip!! We're still backing up.. Thanks to everyone that has contributed so far. Please don't forget to include the i### subdomain (it may also be in the form of s###) from the Photobucket link as well as a link to one of the pages on the forum so we can confirm images are working. Thanks, and please, keep them coming!! This post was last modified: 07-07-2017 01:55 PM by Nicodemus. Anyone else having problems even dowanloading? At first I couldn't get the entire photo library to download, now I can even get individual files to download. Of if they do, its downloading an empty jpeg file (shows as zero bytes at the downnlaod modal window). This post was last modified: 07-12-2017 09:59 PM by Willmark. This post was last modified: 07-13-2017 01:51 AM by Zanko.